1. The resistor is connected only over the blinker circuit. So that is an intermittent load that doesn't count that much. I didn't change the bulb to LED because of that, but because the fact that my parking light where ORANGE (combo bulb with the blinker). 2. Note that now the parking lights are LED too (white) and those are running all the time, so I am "saving" energy with them 100x more than what I don't save with the blinker. 3. Why I didn't use a modified relay that doesn't "hyper-blink" without resistors? Because my rear bulbs are still normal. If one of them burns out, I have the hyper-blinking notification for that event. With a modded relay, I don't. I have installed in front a LED blinker/parking light combo in place of original 3457A bulb (orange-painted version of 3157A). The parking light turns off automatically when turn signal is on, to maximize the LED blinking visibility. The headlight bulb is GE 9007NHP (Nighthawk PLATINUM). Under the dash, I have cut one wire, solder the diodes and cover the joints with thermal shrink tube. Attached is the diagram. I have used two Schottky diodes in one capsule (STPS60L45CW) because of their reduced voltage drop (and because I had one laying around), but probably any diodes that are rated minimum 3 Amp (36W) are good. 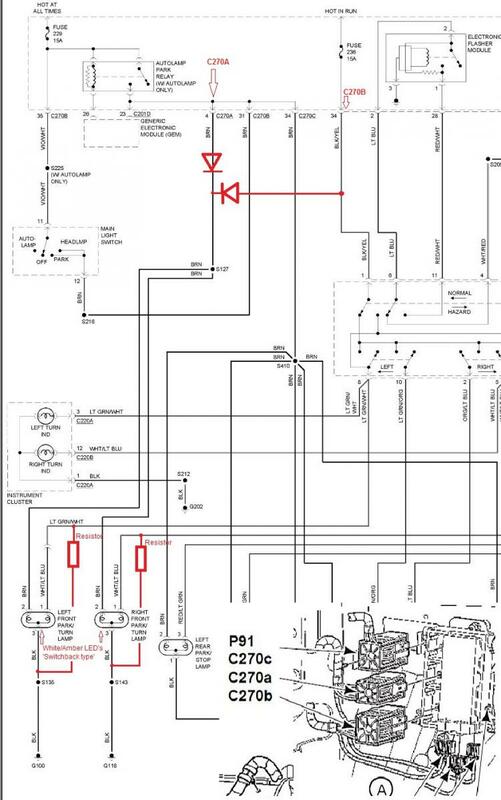 On the 2001 schematic I have shown the connectors location (pin numbers are marked on the connectors) and also the resistors needed for correct blinking rate of the turn signal. Last edited by SoNic67; 07-11-2015 at 10:04 AM. There are ways to convert lighting over to LEDs without having to put a series load resistor to emulate the resistance of a filament. One way to compensate is swapping out the resistor (to a higher value) within the flasher itself to slow the flasher unit down. Another way which neglects any power savings but results in more ideal current regulation and higher light output, involves usage of transistor downstream in whats known as a current mirror (see http://www.allaboutcircuits.com/textbook/semiconductors/chpt-4/current-mirrors/). The way the current mirror works is by using a bias voltage between the collector (top most leg shown in the diagram) and the base (middle straight leg), as well as a gain factor beta (β). For a standard Bipolar Junction Transistor, the voltage between the base and the emitter (bottom most leg, denoted by the arrow) is 0.7 volts. What this means is the voltage on the base leg(s) will always be 0.7 volts higher than the emitter and VCC will be the base voltage plus the voltage dropped on the biasing resistor. The amount of current going through the bais resistor is typically the gain factor beta plus the current going into the base, but since the gain factor is usually orders of magnitude greater the base current can be disregarded. The goal of this circuit is, since all the base legs are tied together, the voltages on the other legs must also be the same, therefore the currents will also be same (this is based upon usage of similar components being used). In this configuration, the sum of the currents should add up to the point where the flasher unit will see a current similar to a filament system. Hope this info helps you guys out. Last edited by cybhunter; 04-25-2016 at 08:46 AM. I don't think this has been mentioned earlier in the thread, when replacing filament lamps with LED's you may want to pay attention to the color temperature of the replacement LED, especially for interior lighting. Non color specific LED's range from warm white (yellow white), which is closer to a filament lamp, to daylight (blue white) which is similar to light on cloudless blue-sky day. I found that bluish light from the upper spectrum (5000-7000 kelvin) tended to be harsher on the eyes at night while light from the low end up to medium white (2800-4000 kelvin) was easier to tolerate.